BrandStack had been part of the lives of many designers and brand seekers. After some time of serving the people, it took a detour when it was acquired by another creative mind. BrandStack had started a benchmark for high quality designs but when it had a come back as BrandCrowd, what they have started was brought to the next level. Both brand seekers and brand makers can be interested in BrandCrowd for it can help them in acquiring brands and selling brands. It is a marketplace for buying and selling ready-made brands and logos. Domains with logo combinations can also be purchased here. It is the home of excellent designers with high quality outputs. It is also the ideal place to promote one’s portfolio to a vast number of clients. Designers around the globe will surely love BrandCrowd. It makes work a lot easier for them. It only takes three simple steps to Sell Logo Designs. First, you have to upload your design and enter some brief information about it serving as supporting details and to aid buyers to easily find the design. Second, sell your designs even if you don’t do anything but wait for it to be purchased. 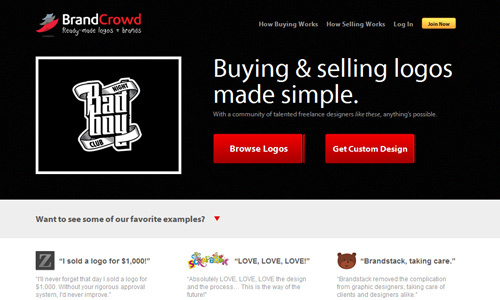 BrandCrowd has a huge number of people who browse through the designs, giving more chances to have designs sold. And the third step is for you to make money from your designs. You started with BrandCrowd without paying anything but you will end up getting 60% commission from your sales. You have choices on how you want to get paid- may it be through PayPal or Moneybookers. BrandCrowd wouldn’t be complete if there are no logo design buyers. As thousands of designers upload their work, thousands of buyers also browse the sites for prefab logos. It is very simple to purchase a design. Same as selling, it only takes three steps to acquire your own brand. First, you have to browse from the logo market by typing a keyword or by looking for it in a certain industry located in the categories at the right side of the screen. When you have chosen a design, you can customize it to fit to your needs by sending a request to the designer. Second, buy the logo by adding it to your cart. If the price of the logo is not within your budget, then you can make an offer to the designer. Prices are allocated by designers and they are the ones who have the right to change the price for you. Most of the time, prices are negotiable. If you are done, you can now download your purchased logo within 24 hours. BrandCrowd have to verify the purchase first through a phone call and email to avoid fraudulent buyers. After determining the legitimacy of the transaction, the vector source file in Adobe Illustrator or EPS format will be sent to you. Once sold, the design can longer be sold again. 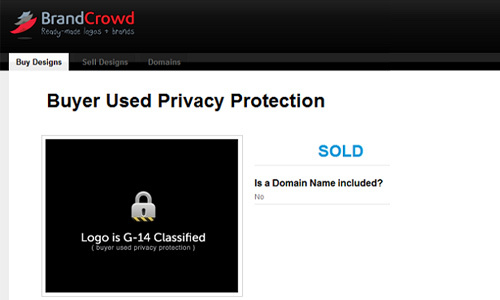 But since BrandCrowd has minimal marketing rights to the designers and sellers, buyers can do private selling. There is a Buyer Used Privacy Protection feature where the buyer can hide the purchased logo in order to resell it or merely to conceal it for the benefit their own company. BrandCrowd is a marketplace where you can find the right designs for you and where designers can sell their unused concepts. Things are made much easier here due to their simple and fast process. It can help you do away with the complicated process in searching for designers and dealing with complex design processes. BrandCrowd have been in the design community for a long time and they could deeply comprehend the industry no matter how many changes come along the way. For buyers, this is the place where they can get the designs that suits their needs in a lower price and in a faster manner. For designers, this is the place where they can showcase and sell their unused concepts. Both buyers and sellers can are also well protected in BrandCrowd. Check their site now for more information. Dear NaldzGraphics, Thanks for writing a blog about us! @Mike (and any other NaldzGraphics readers) – here’s a discount code for BrandCrowd (ZVVKG5) valid until the end of Jan 2012.
wow! Now I know! Thanks for informing us on this! Hey NG / readers, we just launched a $5,000 give away for logo designers on BrandCrowd. It’s good to know that there’s a site for this. I will recommend this article to my friends. Great promotion! I will check this site and email my Uncle about this! Thanks for sharing. This is very useful! BrandCrowd is a great tool in selling and buying logo designs. You are very helpful and I will continue to support you, too! Thank you so much!